1960’sJohnson Harvesting began in 1960 with one 92 Massey Harris combine and a single axle grain truck. By the end of the decade we had established ourselves with many customers we still have to this day. Click here to see more photos of the 1960’s! 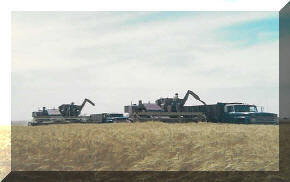 1970’sThe seventies proved to be an era of rapid change for Johnson Harvesting. Operating 2 John Deere 95 combines proved to be inadequate to handle our quickly growing customer base. Soon we had upgraded to 4 6600 John Deere and then to 6620’s. Click here to see more photos of the 1970’s! 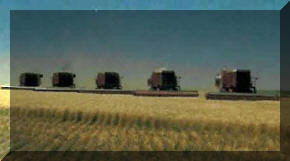 1980’sThe eighties was the beginning of our ongoing relationship with International Harvester and now the Case Corporation with the purchase of our 1st 1460 in the fall of 1980. Within a couple years we had changed brands completely and were running 5 IH 1460’s. Click here to see more photos of the 1980’s! 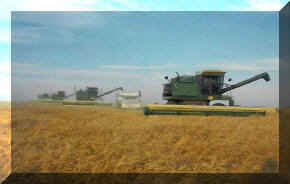 1990’sDuring the nineties the growth continued with the purchase of 1660’s, soon bringing the number of combines to 6. In 1995 we upgraded to the 2100 series, the last of the 1460’s was traded with 7500 hours proving the reliability of the rotary combine. By the end of the decade 2388’s were the heart of the operation. Click here to see more photos of the 1990’s! 2000 and Beyond!We look forward to continuing our growth in the new millennium. We have already seen many changes in our operation this decade and we would love to make YOU part of our future success!!!!!!! Click here to see more photos of the 2000’s!